Where Am I? Happy News, &, What’s That You Say? During this month’s Camp NaNo writing challenge, I decided to count hours instead of fresh words. That flexibility offers a chance to work on edits and new story as I see fit. Yesterday and today I made minute changes to a short story. Finished reading those words, I moved back to a WIP with different characters. In one amusing moment this afternoon, I recognized a mistake. Switching between Nickolas and Alex in Cincinnati, I set Arick and Lita in that same region instead of their native US state of Idaho. I rectified that with a chuckle. Meanwhile, I am enjoying this ongoing dedication as a writer sans the stress of attempts to publish. We shall see what the future holds in that department. In other happy news, lunch with someone considered the little brother I never had and a lady who has been making him very happy rounded out another successful and rewarding day. Now I’m about to join my husband for some YouTube video content. On a less pleasant front, a few days ago his hearing seemed to take an abrupt and sever downturn. Deaf in one ear for several years, attributed to otherwise asymptomatic mumps (shocking considering he received inoculations in the Air Force decades ago), my spouse has been turning broadcasts up to the point it makes me flinch on occasion. To combat this, I put cotton in my ears. Even that proved inadequate the other evening and I located Styrofoam ear plugs. When spotted, that did not go over well. He stormed out of the room and got on his computer. Today I implored him to get a hearing test. He met that with stoic dissatisfaction. I guess we all are in denial over something. Any suggestions for what I should do next? How far should I push, and how fast before things deteriorate further? Anything exciting happening in your neck of the woods? This April, for a writing challenge I have continued my work-in-progress (WIP) revamped during National Novel Writing Month last November. It’s been a joy spinning the romantic yarn and exploring the plague upon poor young Arick. He and Lita, I’ve decided, are going to make a formidable team against supernatural forces of evil. For a change, my tale is spooling toward novel length. Today I realized how and why a man from each generation of Arick’s family suffered his burden, saving innocents from accidents and murder. Their bloodline can be traced back to the evil and cruel Delphine LaLaurie from New Orleans in the early 1800s. The society woman’s heinous crimes were familiar to me thanks to “American Horror Story: Coven” several years ago. In my tale, her monstrous spirit lives on even as her descendents pay for her crimes following a Voodoo curse. Reading some details on the Mental Floss website proved more hair-raising than fiction. Seven other atrocious tales round out the article. In case you share my morbid fascination, you can find it here. Do you like horror movies/shows? I have seen light at the end of the tunnel through my anxiety issues. Talking to a doctor and getting on medication have me feeling on a more even keel. I even managed getting to the YMCA two days in a row last week. Then I fell ill with some sort of stomach bug the night after my second trip. In an ironic twist, my husband thinks I picked up something at the gym since we ate pretty much the same exact foods at home all week and he stayed healthy while I turned inside out. It took me five days recovering before I felt up to proper exercise. A little apprehensive, I returned to the gym yesterday. And I got my payoff, dirty old lady style. While on one of the resistance training machines, I saw the most beautiful boy walk past. He had exquisite lean muscle tone, impossible to miss since he wore a sliced up excuse for a shirt that gave a gorgeous view of his bared arms and lats. And he worked that thick head of shoulder length dark hair, flipping those coiled locks after each rest between weight lifting sets. Since my lovely spouse is so confident and tolerant of my adolescent sensibilities, I admitted my lechery upon returning home. He laughed when I spoke of changing my routine to keep the guy within casual viewing range. 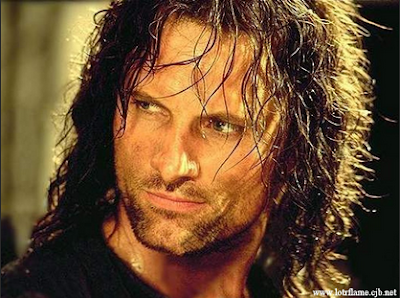 Back in the nineties, my silly guy debated with me over who was hotter from the “Lord of the Rings” trilogy, Legolas or Aragorn. Over time, I came to agree with him that it’s the latter. ~grin~ He called Legolas a ‘greasy elf’. Have you read J. R. R. Tolkien? After my friend introduced me to the term ‘first world problems’ I can’t stop applying the term. Today’s little gripe definitely fits. Another one of them has an actual name – choice paralysis. It’s when a person goes to the modern grocery store and has trouble finding the desired item due to so many options. That issue cropped up yesterday in an unexpected way. Shopping with my husband, I decided to pick up a box of sesame sticks. They’re one of the few snacks I crave, if only now and then. Last night I opened the container and put one in my mouth. Instead of succulent sesame, I got hammered by garlic. It turns out the manufacturer decided to try a new recipe. These are ‘everything’ sesame sticks. Just like the bagel of the same name, I find the taste overwhelming. One of these days I’ll learn to check every last label to the finest print. Oh, well. They can be eaten along with the white cheddar crispy things my husband picked out and decided they taste horrible. Maybe they’ll cancel one another out. 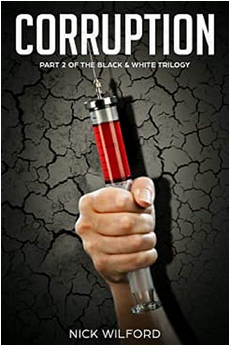 “Corruption” is the second book in Nick Wilford’s Black and White series. As in any good second act, the success of our heroes comes into question. The apt title alludes to that. My favorite part of this story is the bold adventure our intrepid trio undertakes. More timid with every passing year, it seems, I enjoy the heroism of others. Their motive is both clear and laudable. The teenagers’ scientist friend George promised to update Wellesbury Noon and Ezmerelda Dontible, along with Welles’ long lost twin brother, on his group’s quest to cure the insidious disease killing the Loritanian populace, crippling their society. When the kids hear nothing, they don’t sit on their laurels in the relative safety of Whitopolis. They take action. What they find at the end of their ocean voyage is staggering. One can only imagine how they will make restitution for the evils perpetrated upon this continent. And I look forward to reading just what Mr. Wilford’s mind has conjured. My only complaint is how unabashed is the evil here. Of course, the series is called “Black and White”. And much younger readers are the target audience, not that I’m anywhere near the most sophisticated person on the planet. As with the first book, this manuscript is exceptionally clean. That’s important to me, as typographical errors yank me out of a tale faster and with more jarring impact than just about anything else. Well done, Mr. Wilford. Thank you again for this opportunity to read an advanced, gratis copy. My apologies for the delay in repaying your kindness with a fair review. If you, dear reader, are interested in dystopian fantasy stories, I hope you will check out this series. Is there any sort of adventure or act of bravery that would lure you out of your comfort zone? Out of season, but funny story. Hope you enjoy the article. 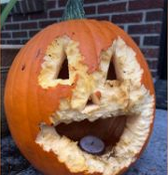 Do you carve jack-o'-lanterns for Halloween?